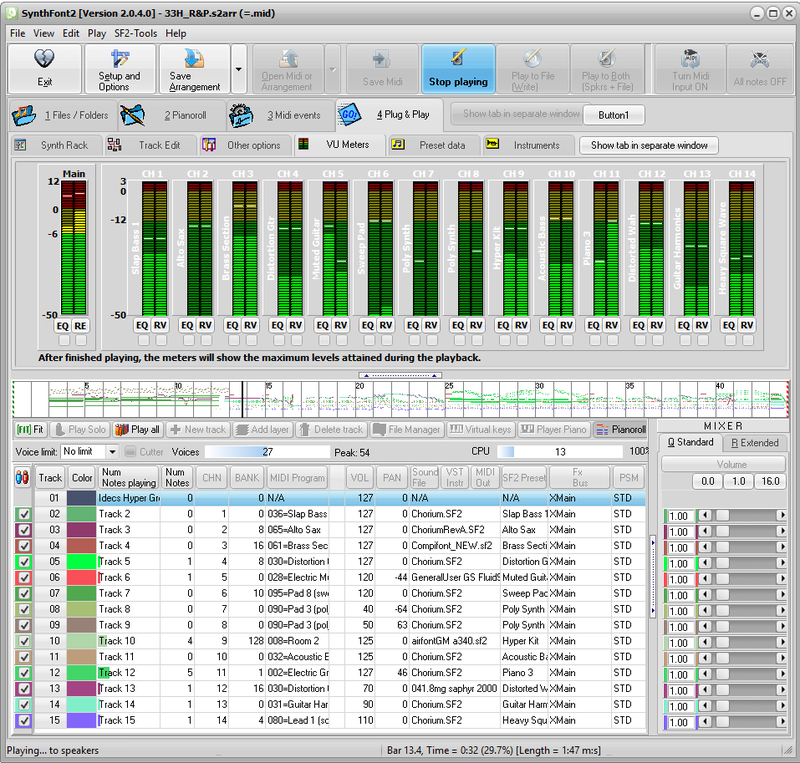 Image shows the "Plug & Play" view with MIDI file tracks at the bottom and VU meters (for the MIDI channels) at the top. Live playback of MIDI from any MIDI port. Supports SoundFonts and VST effects. 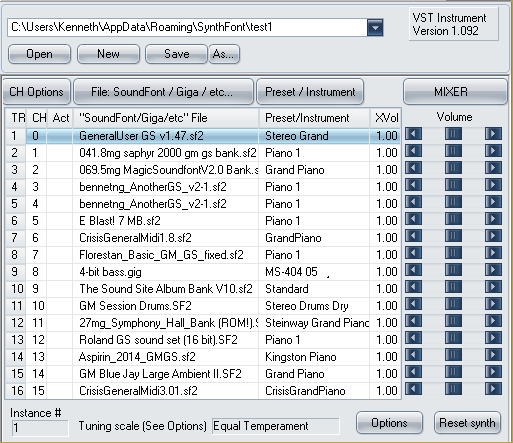 VSTSynthFont is a VST instruments capable of using SoundFonts. SynthFont (free V.1 and paid V.2) is a program for editing and playing MIDI files using various sound source files like SoundFonts, GigaSampler files, SFZ files and more. VST instruments can also be used instead of a sound source file. A midi file is different from - for instance - an MP3 file in that the file does not contain any audio data. Instead, the file is a collection of notes and instructions for how to play them. SynthFont combines this data with the audio data in a SoundFont to produce ("render") an audio version of the song. Here are a few audio samples in MP3 format made by two devoted users. Version 2.2.2.0 of SynthFont2 and SynthFont2x64 released April 13th, 2019, is available. Get it now! Version 1.730 of the free SynthFont1 released October 16th, 2018, is available. Get it now! Click here to read more about SynthFont2 features. Click here to see some SynthFont2 screen shots. Viena is a FREE SoundFont editor (not to be confused with one other editor called "Vienna"). Viena can be used on any MS Windows computer independently of audio card installed (as opposed to the "Vienna" software). 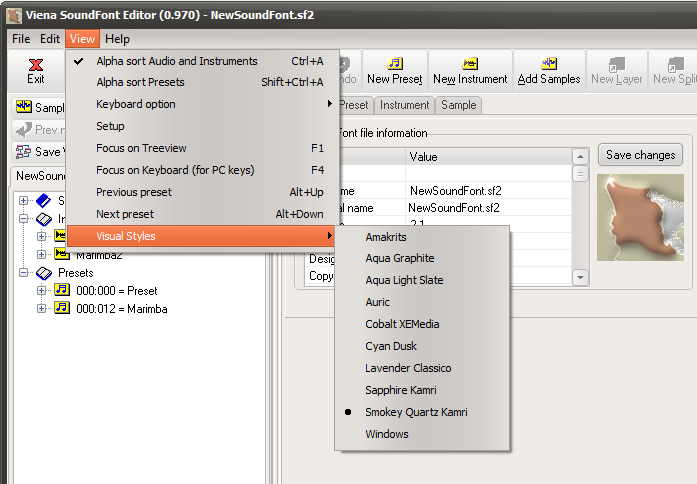 Viena makes it easy to create new SoundFonts, copy Instruments and Presets between SoundFonts and change values for Generators. Version 1.121 released March 8th, 2019, is availabled. Get it now! NEW: There is now also a 64 bit version. Get it now! SyFonOne is a Midi Port player based on SynthFont and VSTSynthFont. Hook it up to your Midi keyboard, or via a virtual midi port to your sequencer and play MIDI using SoundFonts. Version 1.061 released March 6th, 2019, is available. Get it now! VSTSynthFont  is a completely new VST Instrument version of VSTSynthFont (VST PlugIn Interface Technology by Steinberg Media Technologies GmbH). Use together with any suitable VST host. Available both as a 32 and 64 bit plugin. Versions 3.200 of was released February 19th, 2019. NOTE: VSTSynthFont  is not freeware. You can try it for 15 days and then purchase a license for a mere 15€. Get it now! 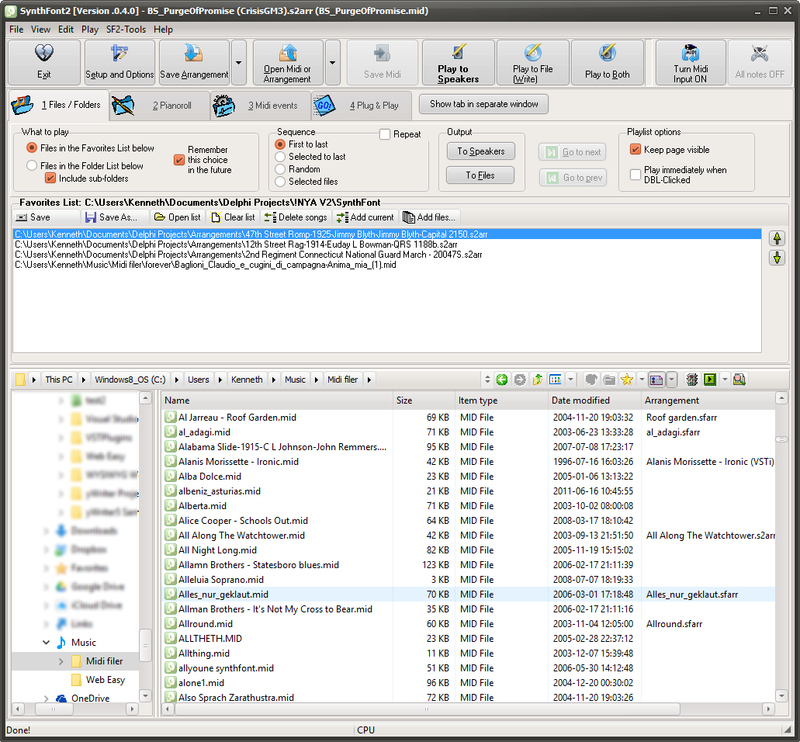 Files and Folders - on this page you have the option to create Playlists and to use a file Explorer to find MIDI files or SoundFonts. Instead of normal Playlist you can choose to play or or selected MIDI files in the Explorer folder. 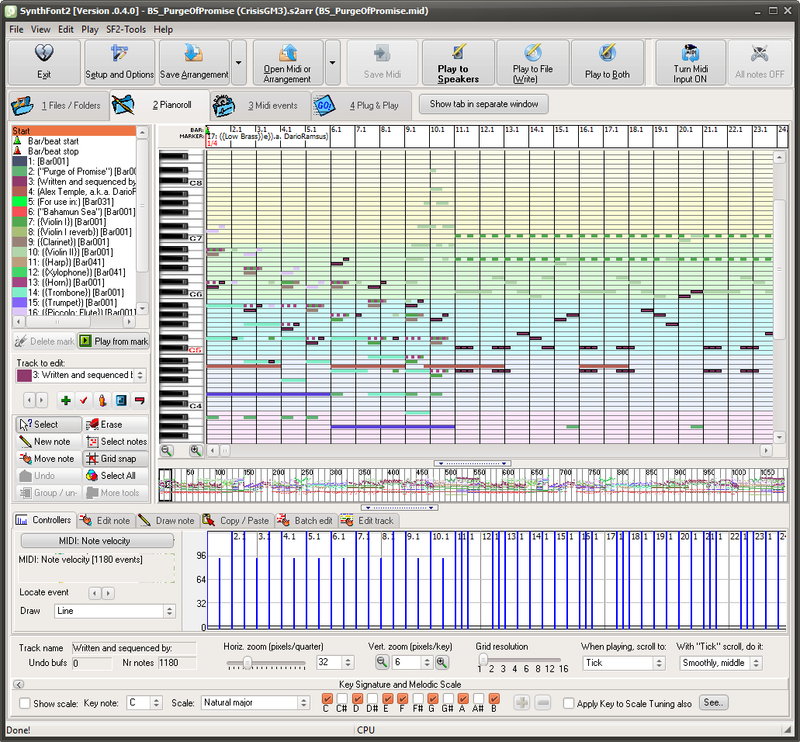 Pianoroll - on this page you have the option to look at MIDI data in graphical form. 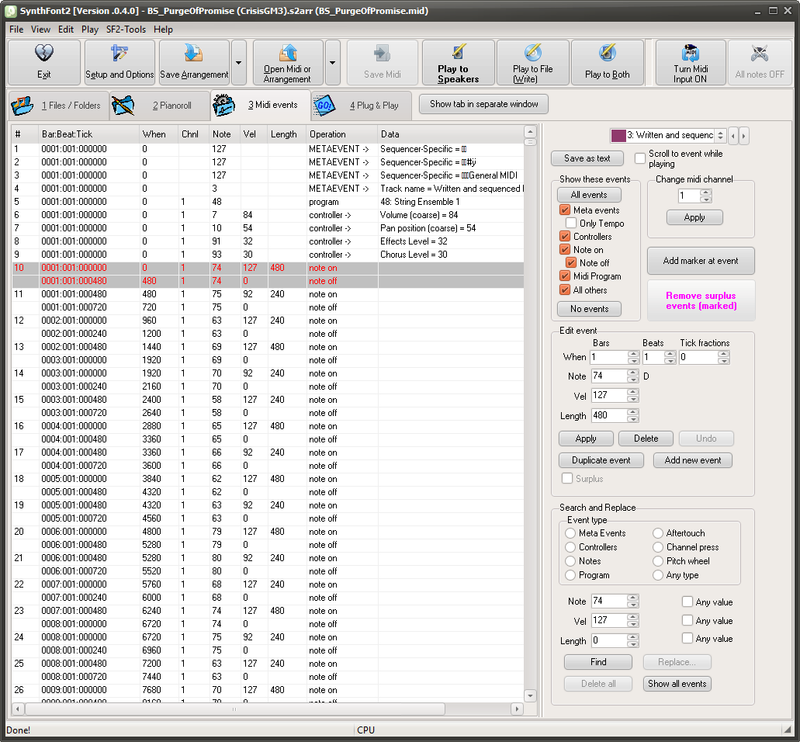 At the top the notes are displayed and at the bottom you find a range of tools for editing MIDI data. Midi events - on this page you have the option to look at MIDI data in textural form; all events or filtered events in a table. To the right you find a range of tools for editing MIDI data. Plug & Play - on this page you have the option to look at MIDI tracks and change a range of parameters related to playback. Here you can assign SoundFonts, Presets, VST Instruments and VST effects to the tracks. Here are some MIDI file arrangements made with SynthFont2, posted here just as examples. 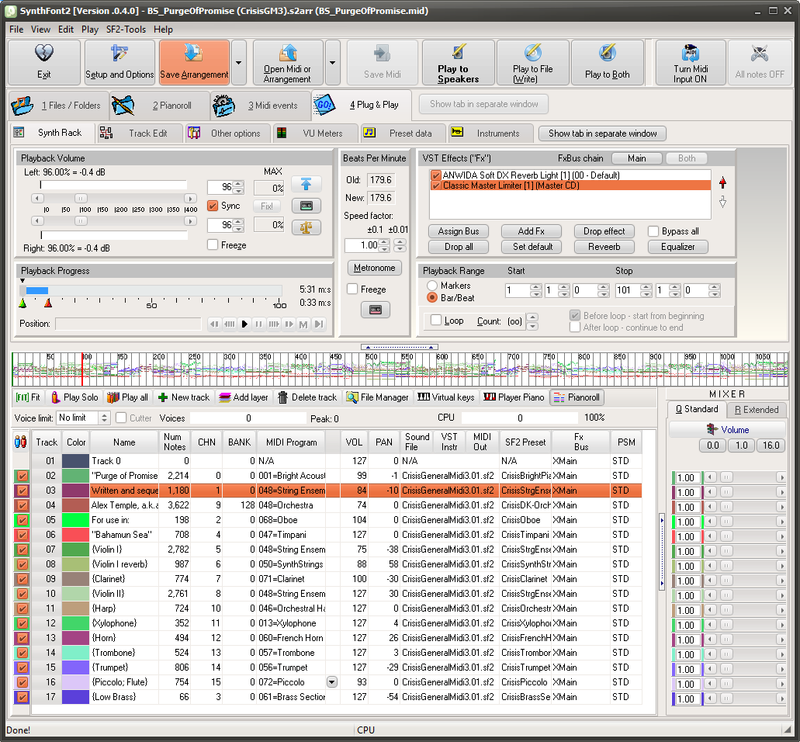 A range of standard SoundFonts were used. Additionally the audio has been enhanced with various basic VST effects; reverbs, equalizers, limiters, compressors and the like.